If you’re a new cat owner, you may be overwhelmed with choosing the items you need most for your cat. There are many different cat beds, toys, climbing trees, and other cat items that are not always necessary for every cat. What all cats do need is a good litter box. 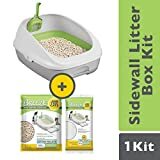 Some cats can be picky when it comes to the style of litter box you use so you may need to try a few different types before you find one that your cat is happy to use consistently. If you find that your cat has an accident outside the box, it may be because they don’t like the litter or the box that you’re using. When choosing a litter box it can be helpful to find an option that is easy to clean. 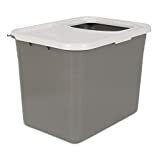 Litter boxes come in many different styles with some being easier to scoop and empty that others. There are even some options that are self-cleaning which helps to reduce the amount of time you have to spend on keeping the box clean. Some cats prefer simple litter boxes without a top while others like an enclosed box for privacy. There are also boxes that allow the cat to enter through the top which can help reduce the amount of mess around the box. You may also want to consider the age of your cat as senior cats may need a box with lower sides for easy entry. The following is a list of the top 10 best litter boxes for cats. 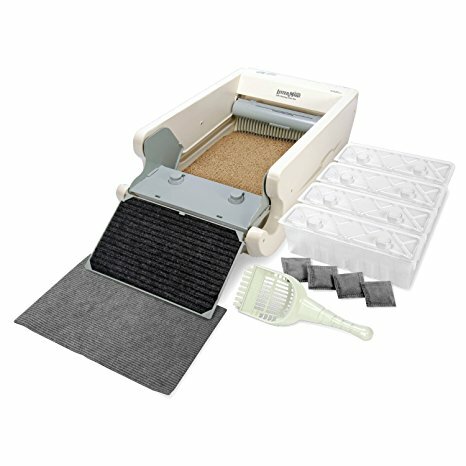 The Petmate Clean Step Litter Dome is ideal for cats of all ages. The steps can be beneficial for older cats who may have trouble stepping into a high-walled box. These steps also help reduce the amount of litter that gets tracked outside the box. The box is larger than most other litter boxes to accommodate cats of all sizes or households with more than one cat. This dome litter box from Petmate is made of plastic that is easy to clean. The box is manufactured in the United States with durable materials. It has a carbon filter on the top that helps to reduce odors in your home. The box has a unique design that offers privacy for your cat. 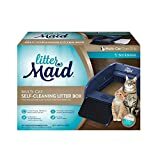 The Littermaid LM980 Mega self-cleaning box comes equipped with a strong and durable drive system to works hard to keep your litter box clean. This design means you spend less time dealing with mess and odor that is associated with scooping the litter box. The box has extra high walls and is large to help prevent mess and tracking outside the box. 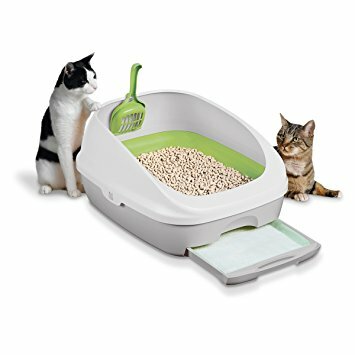 This litter box from Littermaid can be used in homes with multiple cats and can also accommodate large cats over 15 pounds. The unit has a removable rake, with a safety stop, so that you can completely empty and clean out the box as needed. The IRIS top entry litter box has a stylish design that will easily fit in with modern decor in your home. This litter box provides your cat with privacy as they can enter through an opening in the top of the box. The design also means that less litter gets tracked from inside the box as litter from the top can fall back into the box. This uniquely designed litter box works well for homes with dogs as it prevents them from getting into the litter box. The box has a grooved lid that can easily be removed for cleaning and scooping the box. It also comes with a scoop in a coordinating color. These Littermaid disposable and sealable waste receptacles are designed for use with all Classic and Elite model Littermaid litter boxes. These receptacles make the cleaning process quick and easy. Plus, they help to reduce odor in and around the litter box. The Littermaid receptacles come in a set of 18. They are made of durable heavy gauge plastic and have a lid that seals for easy cleanup. 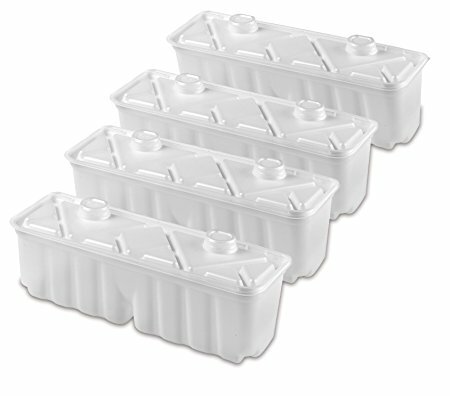 This set of receptacles can be used with the Littermaid carbon filters for even more odor control. The Nature’s Miracle Disposable litter boxes are easy to use and make cleaning up and disposing of used litter quick. This set comes with 2 disposable litter boxes. They are made of recycled paper and are safe to dispose of in the landfill. 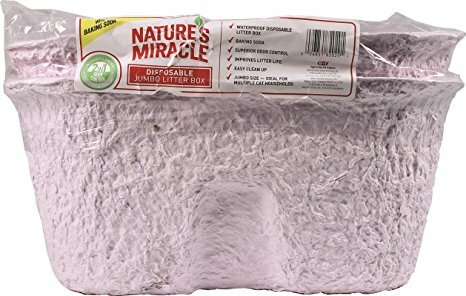 These disposable litter boxes from Nature’s Miracle have baking soda to help reduce odors from ammonia. The boxes are designed to be used with all types of litter. They are durable and won’t shred or leak, even when heavily soiled. The Petmate Top Entry Litter Pan is an affordable litter box that helps keep your cat from spreading litter all around the room. This litter pan also helps keep dogs from getting into the used litter. The box is made from durable plastic and has a tough plastic lid that can be removed for scooping or cleaning out the litter box. 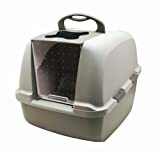 This litter box from Petmate has special grating on the lid that keeps litter contained as your cat leaves the litter box. The box has a molded scoop hook so that you always have your litter scoop at hand when you need it. The Tidy Cats litter box is an all-in-one system that is easy to maintain. This kit comes with a litter box that has high walls to prevent cats from scratching litter out of the box. The litter that is included with the system is designed to be low-tracking to also help contain the mess. 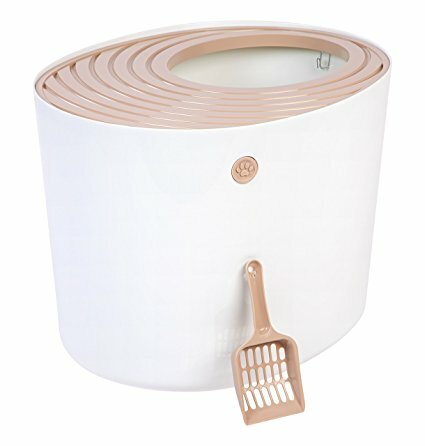 This litter box from Tidy Cats uses absorbent litter pads that help to keep odors from spreading throughout your home. This pads can be purchased separately and are easy to change out as needed. The litter that is recommended for use with the system helps to separate the liquid waste from the solid waste so that the scooping process is easier and quicker. 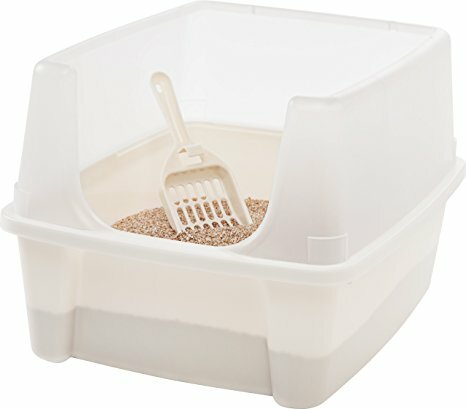 The Arm & Hammer large sifting litter pan is equipped with antimicrobial technology that helps prevent odors in the room where you keep your litter box. This system is easy to clean and allows you to spend less time scooping your cat’s box. The bottom part of the box can be taken out so that you can easily sift out and remove clumps. This system from Arm & Hammer also helps prevent the wasting of clean litter as the unused litter can be used after the clumps are removed. The system comes with 2 regular pans and 1 sifting pan so that you can keep your box clean without continuous scooping. 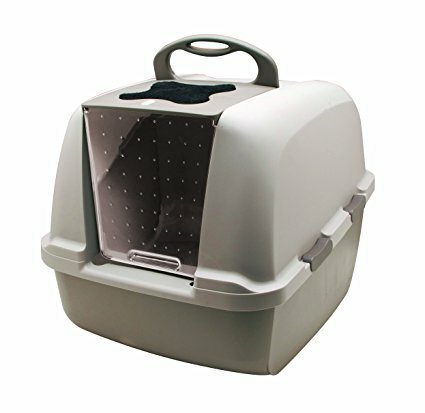 The IRIS Open Top litter box kit provides an easily accessible litter box that has a high shield to prevent your cat from kicking litter on the floor. The system also comes with a matching scoop. The interior of the box has a smooth finish that helps prevent waste from sticking so you can wipe the box clean as needed. 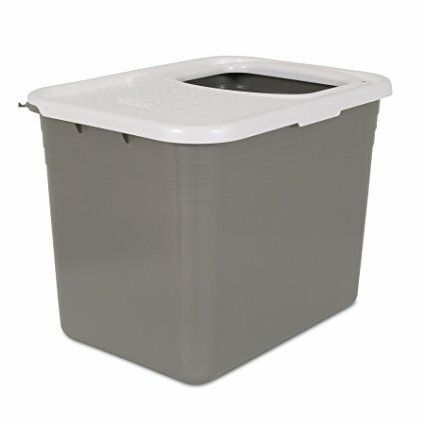 This open-top litter box from IRIS comes in several color options. The box is made of durable plastic that is designed to last. 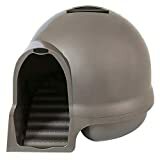 The box has a recessed bottom and feet on the bottom that allows it to fit into smaller spaces than some other litter boxes. The Catit Jumbo Hooded litter pan is equipped with a swinging door that provides your cat with privacy and also helps to contain the litter mess inside the pan. The box has a large lid that can be easily removed for scooping and cleaning the box out as needed. This litter box from Catit comes with a carbon filter that helps to prevent odors from escaping the box. This box works well for homes with more than one cat. The removable lid has a handle for easy access and comes with clips on the side so you can secure the lid to the box to keep down the mess. When shopping for litter boxes, you will soon realize that there are many different options. Some boxes work well for homes with multiple cats as they are large enough for use by more than one cat without needing to be scooped very frequently. Some cats may prefer their own box and will not share with others, meaning that you need more than one litter box if you have multiple cats. To ensure success with your litter box you may need to try a few different styles and it’s essential to keep the box clean as most cats don’t like to use a dirty litter box. Be sure to place the box in a space that is easily accessible for your cat but isn’t in a high traffic area in the house since many cats prefer privacy while in the box. Litter boxes come in a wide range of prices depending on the features you want. 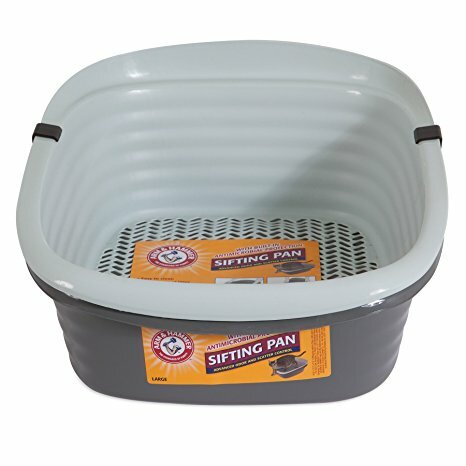 A self-scooping box can be very pricey while you can purchase a simple pan litter box for a few dollars. Some cats prefer a certain style of litter box while others aren’t picky and will use any box. Be sure to read reviews on the boxes you’re considering so that you can find one that is easy to use, and especially is easy to keep clean. Most litter boxes are easy to empty and wipe clean. Keeping the box scooped free of waste and emptying it frequently will help entice your cat to always use to box and not have accidents in your home.